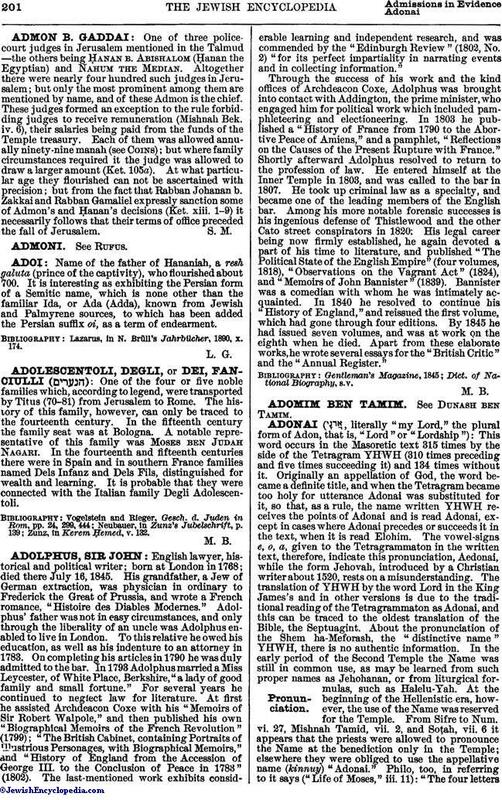 One of three police-court judges in Jerusalem mentioned in the Talmud—the others being Ḥanan b. Abishalom (Ḥanan the Egyptian) and Nahum the Median. Altogether there were nearly four hundred such judges in Jerusalem; but only the most prominent among them are mentioned by name, and of these Admon is the chief. These judges formed an exception to the rule forbidding judges to receive remuneration (Mishnah Bek. iv. 6), their salaries being paid from the funds of the Temple treasury. Each of them was allowed annually ninety-nine manah (see Coins); but where family circumstances required it the judge was allowed to draw a larger amount (Ket. 105a). At what particular age they flourished can not be ascertained with precision; but from the fact that Rabban Johanan b. Zakkai and Rabban Gamaliel expressly sanction some of Admon's and Ḥanan's decisions (Ket. xiii. 1-9) it necessarily follows that their terms of office preceded the fall of Jerusalem.